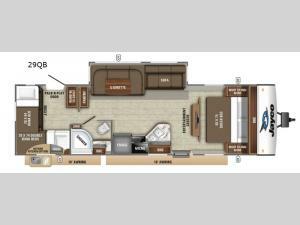 Are you looking for a travel trailer with a single slide for more living space, a rear bunkhouse for your kids, and a private bedroom for yourself? Then you have found all of that and more in this Jay Feather 29QB. 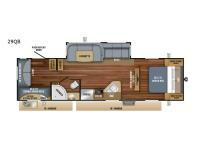 Enjoy meals and plan out your day on the u-dinette and sofa within the slide out. With a front bedroom that features a Jayco exclusive queen Simmons mattress, and a bunkhouse with Teddy Bear "soft-touch" bunk mats and a J-Cube, your family is sure to get a good night's rest. Bikes or other outdoor camping gear can be stored through the Pack-N-Play door or the front exterior compartments. You can even choose an optional outdoor kitchen if you like, choose this model today!